Terms like fiscal cliff, debt ceiling, and sequester have entered everyday vocabularies over the last year. But what exactly does Washington have to do with the stock market? Joseph Mezrich and Yasushi Ishikawa, quantitative strategists at Instinet, are out with a note this week entitled “The Uncertainty That Matters–the Drag on the Market” that attempts to answer this question. 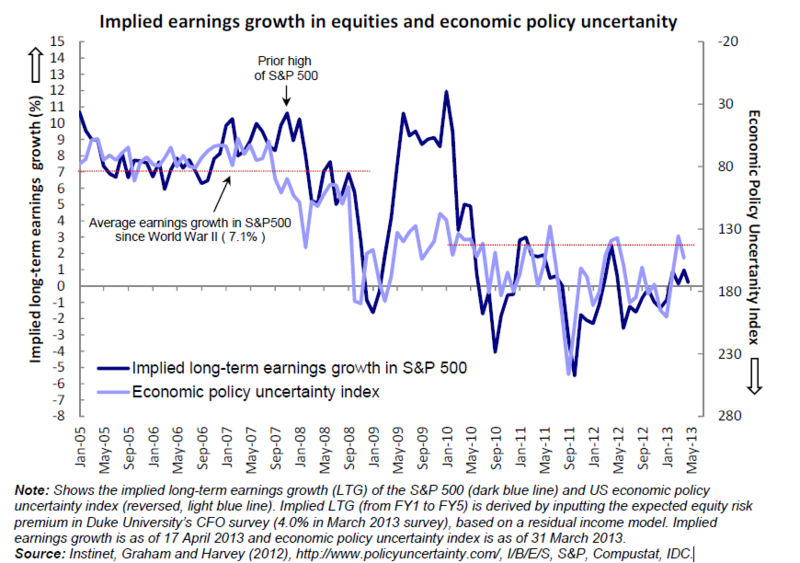 The Instinet strategists overlay the Economic Policy Uncertainty Index with their own implied long-term earnings growth of the S&P 500 and find that there is a heavy negative correlation between the two measures (i.e. 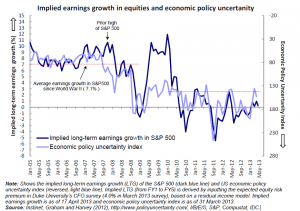 when the Uncertainty Index is up, the implied long-term earnings growth goes down and vice versa). The Uncertainty Index was introduced by three academics at Stanford University and the University of Chicago. The index is constructed of three main components: 1) quantification of newspaper coverage of policy-related economic uncertainty; 2) the number of federal tax code provisions set to expire in the near future; and 3) the level of disagreement among economic forecasters. So, next time your eyes glaze over watching the latest shenanigans in Washington, DC, you might remind yourself that if our nation’s leaders could get their act together for once and provide some more economic certainty, it just might be the spur to more economic growth and a higher stock market.